Friday December 27th 1901 I was busy all forenoon with churning and cake baking, had dinner early and went down to Woolfs to spend the afternoon. Will to town. Saturday December 28th 1901 I spent the forenoon as usual and went to town in the afternoon. I went up to see the Dr and got something for my head. I walked over the river and waited for Will to come for me. Sunday December 29th 1901 Will and I at home alone all day. I read all the time when not busy with the work. It is fine winter weather. 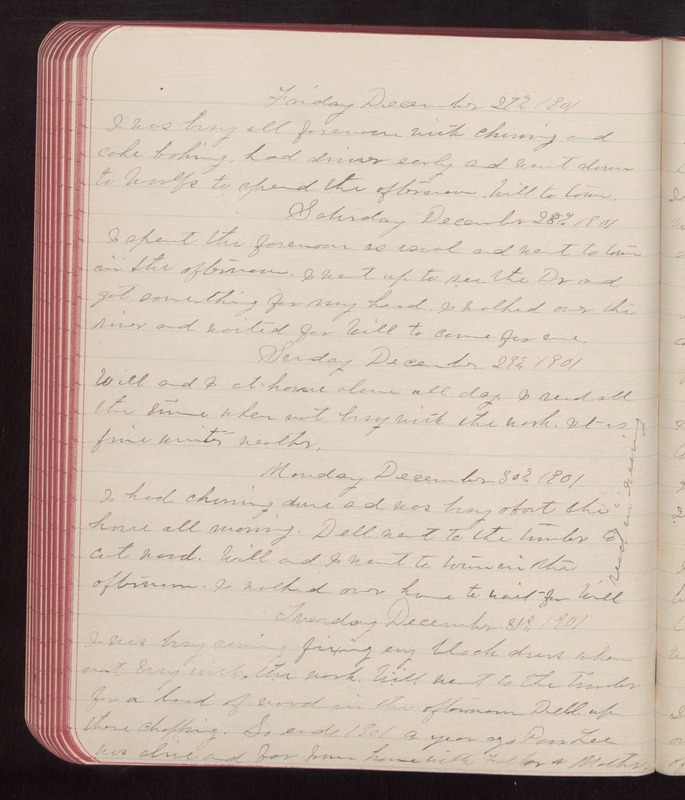 Monday December 30th 1901 I had churning done and was busy about the house all morning. Dell went to the timber to cut wood. Will and I went to town in the afternoon. I walked over home to wait for Will. Read in evening. Tuesday December 31st 1901 I was busy sewing fixing my black dress when not busy with the work. Will went to the timber for a load of wood in the afternoon. Dell up there chopping. So ends 1901 A year ago Pas Lee was alive and far from home with Father & Mother.